MHP leader Devlet Bahçeli speaks at his party's candidate presentation event in Ankara, Jan. 24, 2019. 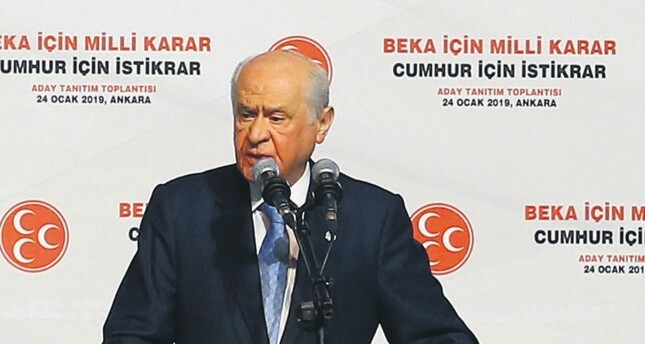 Thursday, Nationalist Movement Party (MHP) leader Devlet Bahçeli called on party members to adhere to the People's alliance by setting aside personal interests, saying that the alliance will triumph in the March 31 local elections. Speaking at the candidate presentation meeting in Ankara, Bahçeli reiterated the MHP's commitment to the spirit of the People's Alliance, adding that the party organizations in each election region will act in accordance with the nature of cooperation. "Without political bargaining and looking after our benefits, the MHP is carrying out whatever is necessary to remove obstacles ahead of Turkey," Bahçeli said. He added that without the well-being of the country, their success would have no meaning. The Justice and Development Party (AK Party) and the MHP first decided to form a political alliance for the previous June 24 elections. As a result, the alliance won 340 seats in Parliament, 290 for the AK Party and 50 for the MHP, while their presidential candidate, incumbent President Recep Tayyip Erdoğan, won the election with 52.6 percent of the vote. Touching upon the new presidential system approved in a referendum on April 16, 2017, Bahçeli said that the upcoming election holds great importance for completion of the transition and institutionalizing of the new system. Bahçeli also criticized allegations from the Republican People's Party's (CHP) concerning possible election fraud. "We will spoil the plans of those who have been trying to discredit the elections by creating allegations of fabricated voters," he said. The CHP brought up allegations of election fraud last week, asserting abnormal increases in voter numbers in certain cities compared to the June elections. Supreme Election Board (YSK) Chairman Sadi Güven denied allegations of imaginary voters and repeaters, adding that Turkey will hold secure and transparent elections. After Bahçeli's speech, the party presented all province and district candidates. The candidates took a photo with Bahçeli. Following the decision to continue the People's Alliance, Bahçeli had announced that the party would not nominate candidates in Istanbul, Ankara and İzmir to support candidates of the AK Party.